We are proud to announce that Helping Hand Group has won an Asia Responsible Entrepreneurship Award (AREA) for our Last Donors Standing program! Last Donors Standing was nominated in the Small-Medium Enterprise Corporate Social Responsibility (SME CSR) category. 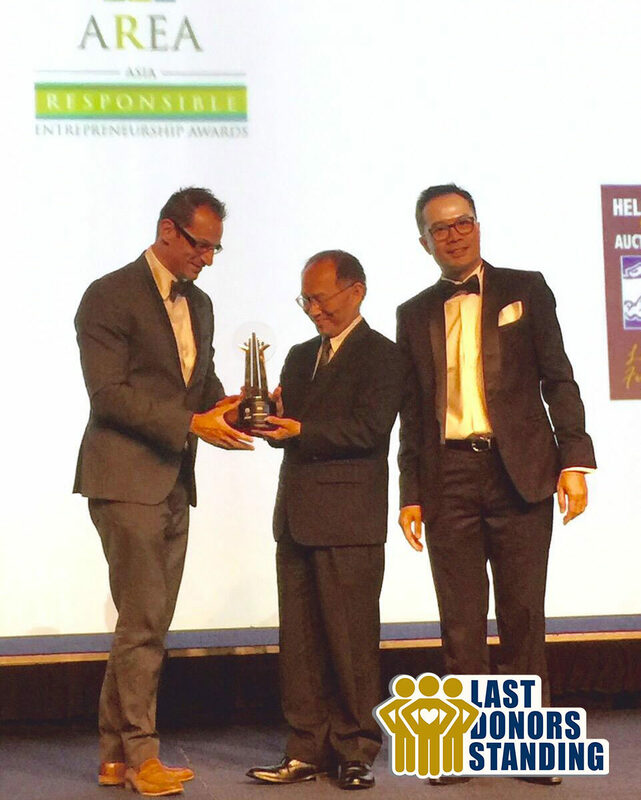 Helping Hand Group Founder, Richard Ernster, accepted the award in Singapore on Friday 24 June, 2016. We are delighted and honoured to have won this award and thank the AREA Group for this recognition. With over 20 years of experience with charities and fundraising, we worked hard to formulate a new and fresh approach in the charity auction sector. Given the high penetration of live (from stage) and silent auctions, our management focused on fundraising activities that would generate the highest return to charities/CSR projects, whilst keeping an element of fun and engagement. We used our extensive knowledge to establish key concepts that would not only appeal to clients but more importantly, the end participant – guests at fundraising events. We spent four months creating, developing, and refining the concept of Last Donors Standing. This was to ensure that the project aligned perfectly with the core ideals of the Helping Hand Group in terms of no-cost to clients and exhibited the ability to raise significant sums for charity and CSR projects. Last Donors Standing is a Live Auction format that was developed by our management team to create a new and fresh approach in the charity auction sector. It gets the whole room involved by having the auctioneer ask all guests to stay standing through rounds of bidding for an item and continually increasing the asking price until it sells. It also allows for more than one successful bidder which in turn means the charity receives multiple donations. Last Donors Standing took the sector by storm and easily surpassed previous outcomes (from other fundraising methods) of one or two sales of a specific auction item. Up to 10 items were sold with each sale generating a multiple donations for a charity or CSR project. The best successes to-date have been eight sales at an event in Hong Kong, benefiting Surgery for Children in Cambodia, and 10 sales at an event in Australia, seeking to find a cure for Spinal Cord Injuries! We are proud to have successfully created a fundraising method with great sustainability. Celebrities, sports personalities and skilled auctioneers have been invited to conduct Last Donors Standing so far. This has led to high engagement and entertainment for guests and generated highly positive outcomes for our charity/CSR partners. Ask our team for more information and how Last Donors Standing can help boost your next fundraising event!